Terminology, techniques and products used in the world of hair and makeup. A colourless liquid used to clean glue off hair lace and is an ingredient in many nail polish removers. Due to the fumes given off, it should only be used in well ventilated areas. Flammable, so it must be stored and used away from heat and direct sunlight. A chemical product that is added to hair bleach to speed up the action of the bleach without unnecessarily damaging the hair. Also referred to as booster, bleach boosters or bleach accelerators. Stands for α-Hydroxy acids, or alpha hydroxy acids. Used in cosmetics products that claim to reduce wrinkles or the signs of ageing and improve the overall look and feel of the skin. For an AHA to be useful, it has to penetrate the skin where it can act on the living cells. AHAs can be synthetically produced or they occur naturally; many AHAs used in cosmetics come from food products e.g. glycolic acid from sugar cane, citric acid from citrus fruits and lactic acid from milk. A technique used to apply a variety of makeup (e.g. foundations, blusher, eye brows, temporary tattoos, tanning colours, colouring special effects) using an air compressor and an airbrush. The compressor pushes the liquid makeup product through the airbrush’s nozzle to create a fine mist of tiny droplets, which settle on the skin. The term for natural and synthetic ingredients that are used to help prevent free radical and environmental damage to our skin. Ingredients include vitamins E and C, grape seed extract, coenzyme Q10, and green tea. Understanding the benefits of antioxidants against the damage caused by free radicals is so important, there is a huge amount of research conducted worldwide into antioxidants. 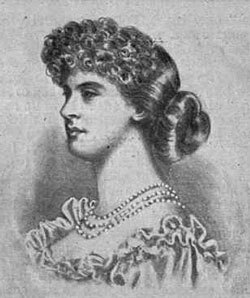 A hairpiece that is worn, as the name suggests, on the back half of the head, using the wearer’s own hair at the front to dress into the back fall. Good for situations where a front hair lace on a wig would be visible. A back fall (sometimes just known as a “fall”) adds volume, texture or colour. 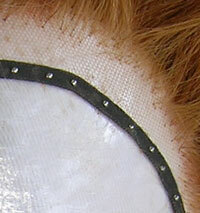 The front fits to the head on the crown area just behind the ears and goes down to the nape. The front hair that is cut to hang over the forehead. Also called the fringe. The brand name of a product used in salons to disinfect hairdressing tools (e.g. combs, rollers, scissors). A hair setting technique where a small section of hair is curled up into an open, barrel-shaped roll and secured/pinned onto its section base. Created on dry hair using hot tongs, or wet hair using fingers and a tail comb. When dressed out, they created waves with lift at the root. Barrel curls can also be used to decorate a hairstyle. BB stands for blemish balm or beauty balm and is a cream makeup product. Promoted as an all-in-one facial product to replace serum, moisturiser, primer, foundation and sunblock (if it has an SPF). It can be worn alone as a tinted moisturiser, or as a regular foundation. It was originally formulated in the 1960s by German dermatologist Dr Christine Schrammek to protect patients’ skin after surgery. Commercially, BB cream became hugely popular in Korea and other East Asian markets in the mid-1980s; only in recent years has it been marketed in the west. 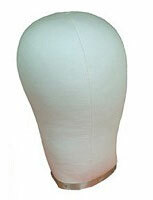 A block is a head- or chin-shaped item used in wig making and wig dressing. There are two different types: malleable blocks, which are made from cork-filled canvas and used to wash, set and dress postiche, and solid wooden blocks, used in wig making. Both types of block come in two different shapes: head-shaped (used for wigs) or chin-shaped (for facial hair) and is known as a chin block. Malleable wig blocks come in even sizes from 50–60 (roughly, 50 = child; 52-56 = women; 56-60 = men) and the size is often stamped on the base of the block. The pointed part of the base is generally the back, but some blocks can warp over time, so check the shape of the block to see the best way to attach the wig. The cork-filled canvas is not waterproof and, as water can distort the shape, blocks must be covered with plastic e.g. Clingfilm. This is then partially covered with a piece of white cloth which helps show the hair lace better and prevents the wig slipping (you should not pin a wig onto Clingfilm only as it slips). A makeup product or technique designed specifically to cover skin pigmentation problems like vitiligo, scarring and birthmarks. Makeup products are usually a highly pigmented cream, so it covers well and only a small amount of product is needed. When set with powder, many products are water, heat, sweat and rub resistant. Good brands include Dermacover, Dermablend, Veil and Supercover. Camouflage technique requires good colour theory and an eye for skin tones. A hairstyle that involves a smooth, twisted, plaited or knotted roll of hair at the back of the head, especially the nape. Often used for evening wear and weddings, as well as for everyday. A flexible style, it can be structured and smooth, or the hair left soft, loose and informal. A cluster is a hair piece with a solid round base that is used to add bulk to a hairstyle, allowing for more elaborate styling, or to add a detail like a pony tail. The cluster starts life as a weft and is stitched into a circular structure for easy of use. Often has little wig clips sewn in to help attach it to the wearer’s head. Refers to the lightness or darkness of the hair. On the International Colour Chart system, 1 is the darkest hair colour (black) and 10 is the lightest (lightest blonde). The colours you see in the hair e.g. red, copper, golden, ash. A makeup product that is used to cover over blemishes, scars and uneven skin pigmentation. Usually a cream product, it is best applied with a small synthetic hair brush and set with powder. Concealers can be found in all skin tones from light to dark, with pink, neutral or yellow undertones. Something (e.g. an ingredient or substance) that can cause an adverse reaction to a hairdressing product, service or chemical. The main structure of the hair shaft and it determines the hair’s texture and colour. A term used by cosmetic companies to describe a cosmetic product that it claims has a therapeutic effect. Currently, it is purely a marketing term, one not recognised by cosmetic governing organisations. The hard outer layer of the hair constructed of dead overlapping scales, which form a protective layer. Healthy cuticles also impart sheen to the hair. Cuticles can be damaged with heat, over brushing and chemicals (e.g. perms, colouring) causing splits, split ends or bloating due to over processing. This refers to a soft sheen created on the skin by some cosmetics, in particular foundation. It creates that fresh-faced look often used in photography. 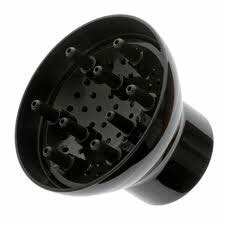 A large circular adapter that you put on the end of your hair dryer. The small holes in the diffuser spread out the air flow from your hair dryer, so you don’t get the full force of the air, creating a gentler drying process. When used on a cooler heat setting, it is good for curly/wavy hair to help dry without frizz. A test carried out by a hairdresser to check the strength and condition of the hair’s cortex. Hair is elastic to a point, especially when wet, but will spring back if healthy. Carrying out an elasticity test tells us how healthy the hair is. Take one strand of hair and hold each end firmly between the thumb and forefinger of each hand and gently pull. If the hair stretches more than half of its original length then it is over elastic and may snap or break during chemical processing. If it snaps easily, then it has poor elasticity. The outer layers of the skin which forms a protective barrier over the body. Also controls temperature, evaporation, sensitivity and absorption. Read more about skin. A hairdressing technique that creates a series of S-shaped waves in the hair. 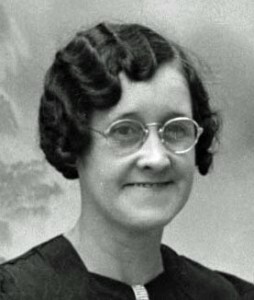 Popular for the short haircuts of the 1920s and ’30s. Also called water waves. One method to create finger waves involves pinching wet hair between the fingers and combing it into flat waves of alternating directions. Hot rollers, tongs or Marcel tongs can also be used to create the waves. A makeup product that is applied to the skin using a sponge, brush, airbrush or fingers, primarily to smooth out skin tone, cover minor blemishes and create an even base for other makeup products to go on. Many different types that include cream, liquid and powder formulations. Read more about foundation. An elegant up-do hairstyle for longer hair that involves twisting the hair at the back into a sleek vertical roll. Galloon is a thin nylon or silk ribbon used to secure the front hair lace of a wig to the wig block. 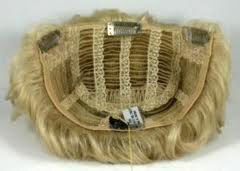 It reinforces the wig lace when blocked and prevents it from tearing. It comes in different widths (about 5-12mm) and is pinned over the hair lace to the block with small dressmakers pins called short whites. Galloon is also used to add strength to a foundations e.g. at the nape of a wig. It comes in a long length, so it can be cut as required, and is available in the basic hair colours (black, browns, grey, blonde). A bit of equipment used by wig makers and looks a bit like an implement of torture! The base has long, sharp metal needles pointing upwards. Used in wig making to mix hair colours, separate different hair lengths and detangle hair. Has a removable cover to protect the needles and nasty mishaps. 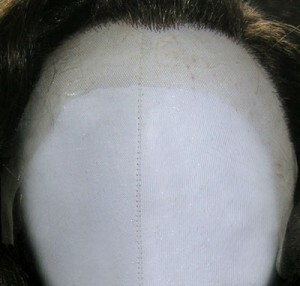 A sheer lace material used as the foundation (or base) for wigs and other postiche items. It is a fine material with a honeycomb mesh that allows for hair to be knotted into the lace. Stands for high definition and refers to the high resolution of television and film cameras and broadcast methods. For makeup, it requires careful blending and use of products to prevent unwanted aspects (e.g. powder, edges, hair lace) being visible on screen. Colours can also be affected by HD, especially reds. A contouring technique used to draw subtle attention to a facial feature by using a lighter colour e.g. use a slightly lighter foundation on cheek bones to create width, or lighter eye shadow under the eye brows to create lift. The opposite of shading. A term that refers to the darkening of an area of skin due to the abnormal excessive production of melanin (the pigment that contributes to skin colour). A test carried out on hair before a chemical service (tinting, bleaching, perming) takes place to see if the hair contains anything that will react to the service, or prevent it from working properly. A small strand of hair is taken and immersed in the solution to be used for ten minutes. No reaction means the service can go ahead. A numerical system used to classify hair depth and tone. Hair dyes have a number on the box, showing what the base colour is and if there are any tones (e.g. 4.15 is a medium brown with ash as the primary and mahogany as the secondary tones). Stands for isopropyl alcohol and is also known as rubbing alcohol. A colourless and flammable alcohol-based liquid. Used for many things from cleaning brushes, activating certain makeup products (e.g. Illustrator palettes) and removing glues. A perm that creates soft loose curls, especially for coarse or Afro hair. Created by American hair guru Jheri Redding, the style was popular in the African American community in the late 1970s and throughout the 1980s. Michael Jackson had a Jheri curl in the 80s. 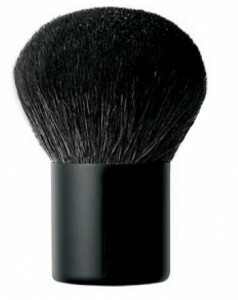 A short, fat and round makeup brush used to apply powder mineral makeup products. Read more about foundation brushes. A tough fibrous protein which is the key structural element in the outer layer of skin, hair and nails. The technique used in wig making to attach hair to a hair lace foundation. A knotting hook (a small tool with a hook at the end) is used to loop and tie the hair into place. It is a highly skilled technique and takes a lot of practice to become proficient. A hairdressing product that lightens the natural pigments of the hair without depositing any artificial colour. Also known as bleach or pre-lightener. A metal curling tong that is heated in a special heater unit. 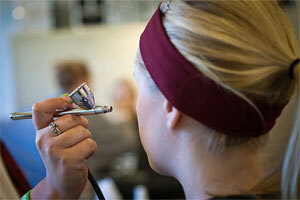 The user manually checks the heat of the tong before using to prevent hair being singed. The tongs come in different sizes, from thin ones used to curl moustaches, to thicker tongs used to created Marcel waves. Marcel waves are similar to finger waves in appearance, but created using Marcel tongs. Another name for spirit gum, an adhesive used to stick hair lace to skin (e.g. wigs, facial hair). Mastix remover is the product used to remove spirit gum glues. This term is used to describe lipsticks, eye shadows, blushers and foundation that have no sheen at all to them. They appear quite flat and have no sparkle or shimmer. Matte products are good for oilier skins, and for situations where a sheen is not required. A pigment that is found everywhere in nature. In humans, it gives us our hair colour and is the main pigment that determines skin colour. The melanin in the skin is produced by melanocytes, which are found in the basal layer of the epidermis. Are cells located in the lower layers of our skin’s epidermis and produce the pigment melanin. 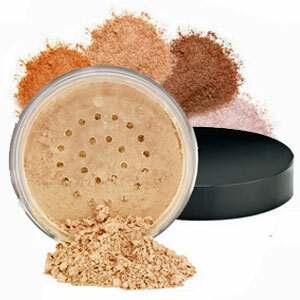 A loose powder makeup primarily made from mineral ingredients and is usually applied with a Kabuki brush. Read more about mineral makeup. A mild spirit gum (or mastix) glue remover, used to remove glue from the skin.